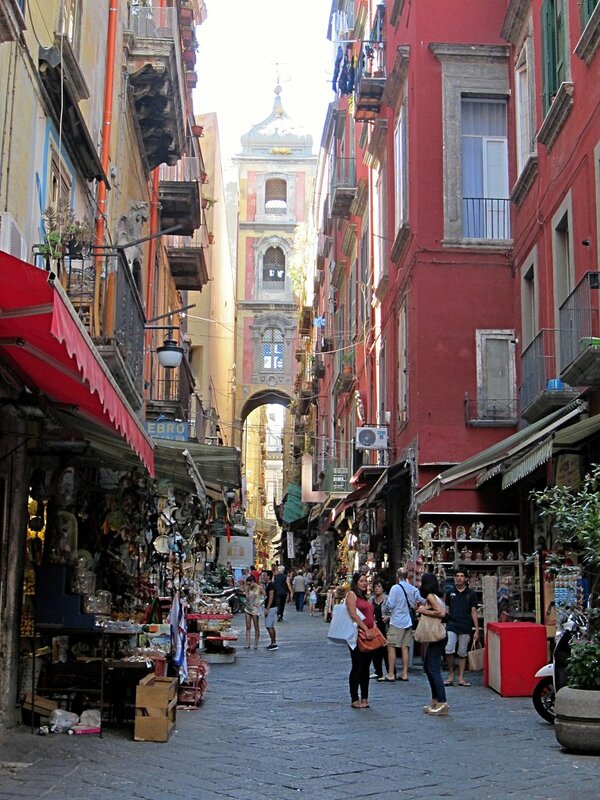 Like the German philosopher Walter Benjamin in his 1924 writing about Naples, Italy (see part 1), the American journalist Jane Jacobs had lovingly observed and described a city's public spaces. In 1961 New York and many other American cities were in peril: lively public spaces were threatened by urban renewal, the automobile and autocratically engineered solutions a la Robert Moses. Jacobs suggested as her antidote mixed use, small scale development, physical diversity and less dependency on the automobile. All would result in more eyes on the street. She had concluded all this under the ominous title of "life and death". Her city New York has since been near death and seen several rebirths. Even though Jacobs was not a planning professional, her views are now widely adopted by urban designers. Yet, the issue of "life and death" is still around for many US cities and "recovery" is far from uniform. 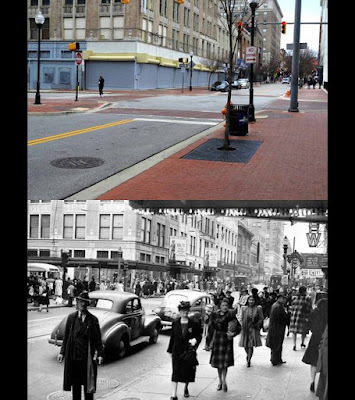 Especially legacy cities such as Baltimore continue to suffer from an often lifeless and also deeply segregated public realm. The French philosopher and sociologist Henri Lefevbre expands beyond Jacob's largely physical analysis of urban space with a wider theory. In 1974 he subjected "space" to the Marxist categories of production and interest, asking whose interest does (urban) space serve? Integrating the different perspectives into a system he wrote "The Production of Space" in which space is described not as an "absolute" (a geometry) but as a social product with different meanings for those who conceived it (produced it) to those who perceive it (consume it) and those enduring it (living in it). His tri-part theory of space aims to integrate "physical, mental and social space". It allows urban designers and sociologists to go beyond design as a matter of geometric order to consider embedded non-physical aspects such as control and power (hegemony). Armed with this more comprehensive understanding of space it is easier to decode what is going on in our urban spaces. It is obvious that Baltimore's transformation from an industrial city to one of service, science and entertainment would inform public space. In fact, the old maker-city didn't have much time for ceremony and display. The front stoop was all that was needed. Baltimore's spaces were mostly formed in an industrial age with strict ethnic enclaves. While residents would walk to their respective ethnic corner stores and churches, they would not mingle with strangers. 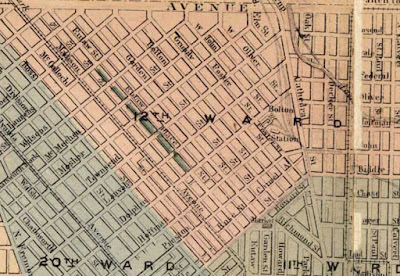 The city of neighborhoods was also a city of strongly separated enclaves. The city was certainly not seen as a playground nor was it really a mixing bowl, no matter how ethnically diverse it was overall. In the urban renewal phase planners wanted to introduce downtown plazas: Amidst the rubble of demolition that preceded One Charles Center they conceived of three new spaces, strung together by (by now demolished) pedestrian bridges but tucked away from Baltimore's main street: Charles, Center and Hopkins Plaza. One could say that these designs ignored Jane Jacob's observation and the lessons from historic cities. As a result these new urban commons never performed well, exept for large events such as the City Fair. It was the converted waterfront of Harborplace that created the kind of leisure space which characterizes the post industrial city: A place of leisure and fantasy which promises a kind of mini vacation. Except, once discovered by tourists, Baltimoreans grew soon tired of HarborPlace and its growing lack of authenticity. But the vacation theme remains: The latest leisure space is the temporary "Sandlot" at Harborpoint. Erected on top of the Inner Harbor peninsula that was originally entirely devoted to industrial production, this latest creation of space is full of irony. Meanwhile, attempts of giving the Inner Harbor a makeover continue when Rash Field will be upgraded soon as a permanent leisure space, with an eye on serving everybody. Sensitized by the 2015 unrest and its own analysis, which confirmed that much more planning money had been spent on predominantly white neighborhoods than on black neighborhoods, the Baltimore Planning Department has recently presented a Green Network Plan with a focus on space creation in disinvested communities. While well intended, it is to fear that Jane Jacob's lessons will be once again forgotten. 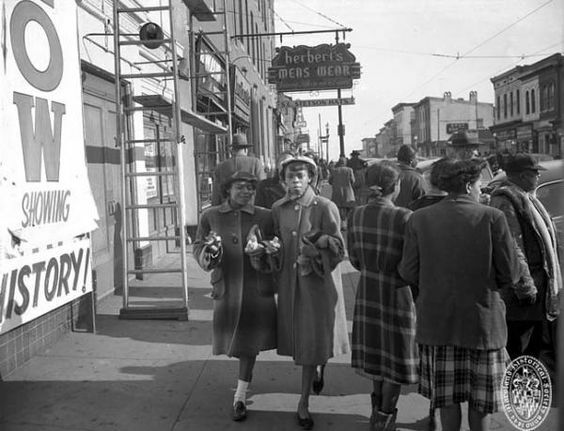 In segregated Baltimore spaces were frequently not there for everybody, a fact that had found its particularly unpleasant manifestation in the openly racial segregation laws which, Lefevbre would argue, were a social product, reflecting the history of the US production system and its forced labor. Space can become a tool in the Arsenal of Exclusion. (Dan D'Oca). Exclusion (or inclusion) can go many ways. It can be subtle through monuments which express power through meaning ("expression of space") or it can be explicit through prohibitions which ban begging "loitering" or assembly outright. Exclusion can also come in the form of bad design: it can exclude women, the elderly or the disabled by disregarding their special needs. Even the privileged and affluent can be excluded if they don't feel safe, welcome or able to navigate what they perceive as threats. In whatever form, such exclusions reduce the diversity which Jane Jacobs considered a key ingredient for a successful public space. Nothing makes people feel better than a lot of other non threatening people that are also out and about. It seems to be important for feeling comfortable and secure, though, that everybody can find others in the crowd that look like them. The frequently quoted "eyes on the street" make the public spaces work, the trick is to get them there. Watching the otherness of others in the public roam is such a basic form of human enjoyment that it has recently enjoyed a renaissance in cities around the world. With the right balance in such a space, otherness is not a threat. Since 1961, both the civil rights movement and a more community oriented design thinking among planners, have reverted many of the anti-urban trends which Jacobs had observed. Successful US cities, including those noted in part one of this article have once again lively streets and parks to such an extent, that the question of exclusion strikes again, this time as displacement through gentrification. For the most part, though, Baltimore and many other former industrial hubs such as St Louis, Cleveland or Louisville still suffer from empty and sometimes anarchic streets and continued high levels of segregation. Jane Jacob's object of observation was New York City, by most accounts, a quite unruly place throughout its history as a city. 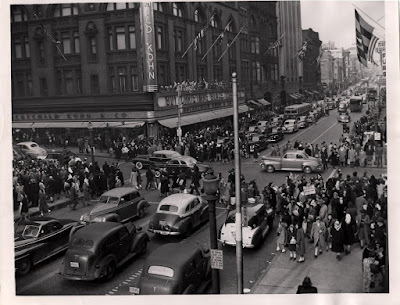 Yet, today the lively chaos of Manhattan is an island of peace compared to the stillness of Baltimore's public spaces. This contradiction of chaos and peace becomes clear if one considers that one can walk in Manhattan for miles without having to fear much of anything. Yes, there are way too many cars and there is too much horn blowing and the sidewalks are often so thick with a walking and gawking public that getting somewhere swiftly is difficult, but there isn't "anarchy". The sheer mass of people requires a common etiquette. On the subway escalator stand to the right, walk to the left. Drivers usually stop for pedestrians who, in turn, mostly don't walk right in front of moving cars while they have the red hand. There are plenty bicyclists generally contently riding in the many bike-lanes, buses ply their dedicated lanes as "Select" service. To keep an eye on it all the police department deploys an army of traffic patrol officers in small non threatening "smart cars" but they have full police powers and can issue citations when needed. There is also surprisingly little trash blowing around in spite the big ugly trash in plastic bags, black for landfill waste, clear for recycling, still put out for collection, a practice that Baltimore has largely eliminated. In spite of the considerable gentrification, the public in the streets of Manhattan remains very diverse, a mixed crowd of different ages, races and appearances, a jumble of languages hangs in the air. The mix is a bit different in Hells Kitchen than on Wall Street, but whether on the sidewalk, the park or the subway, the bikelane or the bus, no population segment dominates entirely and one can walk feeling safe in any part and almost any time. Given the the national housing crisis, the high cost of city living and the rising inequality across America, New York, Seattle or Boston all see large number of individuals who have fallen through whatever safety system. Since their plight remains unresolved, it may sound cynical to point out that in a lively city the homeless, beggars and addicts don't dominate the space and thus don't make others feel unsafe. But it is an important ingredient of a successful public space that no one group should dominate. In Baltimore, by contrast, being out and about in the streets is largely limited to downtown and even there only to a brief time during lunch hour that too often the unfortunate urban underclass outnumbers any other group. The reinvented Baltimore of universities, health industry and tourism is still standing on much feebler legs than the economies of New York, Boston, Seattle or Zurich. 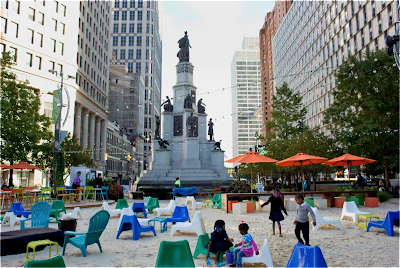 In Baltimore, public space has largely been an after-thought, and even where it became the focus of attention, it was largely hampered by a lack of diverse uses which would fill all the surrounding buildings. 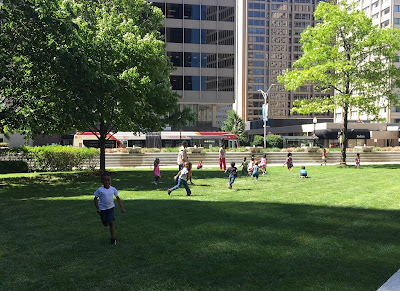 A case on point is Center Plaza, When the Downtown Partnership (DPoB) spearheaded a re-design it listened to New York's Project for Public Spaces (PPS) group which is helping around the country to make public spaces work. DPoB traveled to New York's Bryant Park, a national posterchild of a reclaimed public space, which once had also fallen into a state of neglect and unsafe emptiness of the kind which still plagues so much of Baltimore. Center Plaza was then beautifully redesigned and rebuilt, but to this day it lacks, what PPS considered the key to success: Active uses around the plaza and a lot of programs taking place on it. In spite of thousands of new downtown residents populating converted downtown retail and offices spaces, surrounding ground floor space remains vacant, underused or used without benefit of the plaza. Outside of programmed events mostly homeless use the space. The Center Plaza problem is being repeated in Baltimore's neighborhoods in the name of Project CORE and the Green Network Plan. Here demolition is slated to create urban squares such as Druid Square, once again without ensuring that enough people and active buildings face and frame the space to put eyes on the square. Druid Square will never look like Lafayette Square without the stately structures which make that West Baltimore square so beautiful. But even it struggles under the weight of vacancies and the absence of people to populate it. Baltimore public space will get a large boost once Ryan Dorsey's complete streets bill passes and becomes official policy. Its entire purpose is to elevate streets to a level where they serve people and not just cars. Even though, while public spaces help to solidify the public consensus which every city needs, the people to populate the streets are still needed. 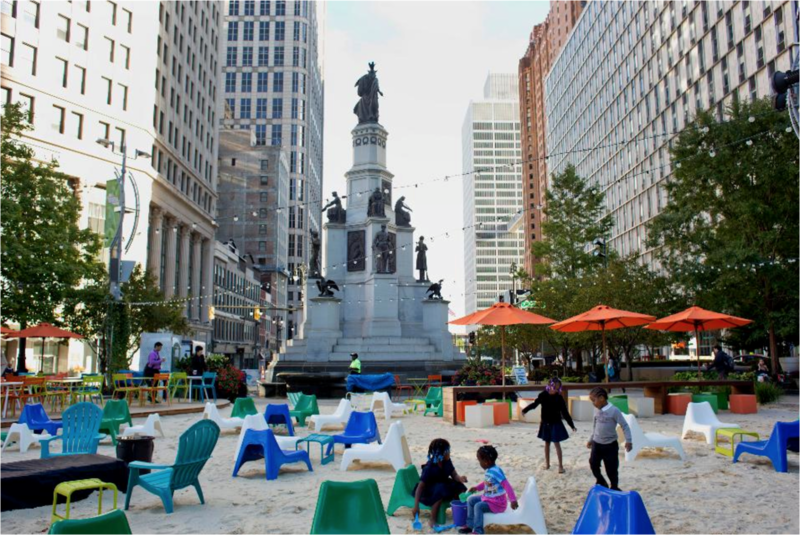 The solution to scarcely populated public spaces in Baltimore is not a strategy of reduction which bans or further discriminates against the less fortunate. 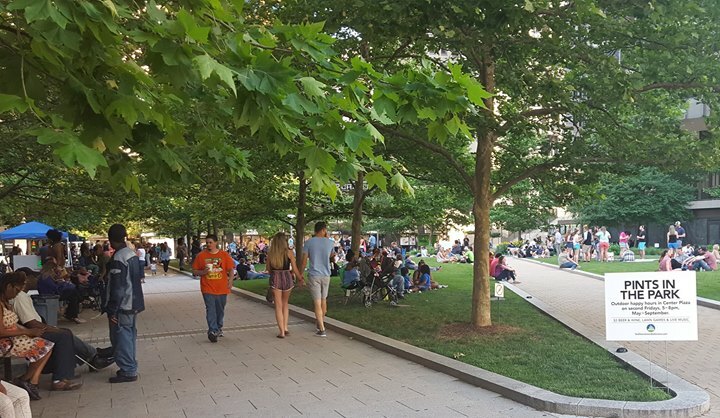 Instead, what is needed is a strategy of addition: More people, more uses to make spaces inviting and safe for even more people to go out into streets, parks, and plazas. Although neither Jacobs nor Lefebvre talk about it, I would suggest to add the theory of the tipping point. The obvious conundrum that empty spaces would benefit from more people, if there only were sufficiently many people to begin with, requires a dynamic view in which a system is fueled with energy until it tips into a self feeding positive feedback loop. To achieve such a tipping point, a lot of things have to be calibrated just right. One of them is the right balance between control and freedom. Another is a redirection of resources away from the big projects which create even bigger dead zones such as a Convention Center. Full focus on reviving depleted Baltimore neighborhoods would most likely create the critical mass needed to fill Baltimore's public spaces and make everyone feel safe. Where are all your people, Baltimore? Anyone coming back from travel to cities such as Boston, New York, Seattle, San Diego, Zurich or Naples will ask this question. Public spaces in this city seem mostly deserted except for cars, even in downtown. In the few places where people routinely assemble, such as near the Lexington Market, police see them as "loiterers" and are doing everything to make their life of miserable. Benjamin had admired the "porosity" of Naples which he saw then of not having hard borders of confrontation and separation. Its hard to see such porosity in Baltimore. In more affluent neighborhoods, such as Mount Vernon, special security details canvas the streets. In poor neighborhoods, such as on Pennsylvania Avenue near North Avenue, the sidewalks are busy but most city residents wouldn't dare to go there. Parks, one of the classic urban commons, such as Leakin or Druid Hill are beautiful, but remain devoid of people most of the time. All this stands in stark contrast to familiar photos of Baltimore's history depicting downtown streets bustling with life. Even refurbished urban spaces such a Center Plaza, remain mostly deserted, no matter the inviting public chairs and tables the Downtown Partnership placed there. How different things could be, becomes manifest during Baltimore's many festivals and events, such Light City or Pride Parade, but the day after the city goes dormant again. Not even Harborplace with its peculiar semi-private status is always lively. In spite of its managed status and limited public rights it has recently lost its status as a perceived "safe space" (as seen by suburban whites) due to some small skirmishes with black youth which were quickly blown out of proportion by certain media. The "safe space", like much of the city's vitality, has moved east. For now "Sandlot"at HarborPoint, an artificial beach with volleyball, food, drinks and a fantastic view of the water, accessed via the promenade easement, is the most convivial space in town, legally not entirely public but busy and popular across class and race. Public spaces in any city are subject to a thick set of rules. Ideally they strike a balance between rights and obligations. 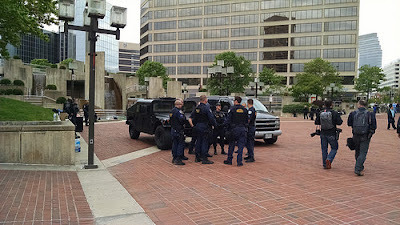 Many would say that the increasingly popular private-public security arrangements infringe on public rights such as free speech. Others would say that in spite of all the management, there is also a pervasive sense of anarchy in Baltimore's streets, even in the downtown area: Delivery vans or pizza services stop in travel lanes or in a bike lane for extended periods, cars speed up like on a race-course, run red lights or block intersections. The rare pedestrians amble aimlessly into traffic any time they feel like it. Dirt bikers pop wheelies in the middle of all the cars. Traffic management by lime vested "officers" employed by City DOT who aren't allowed to give out citations is noisy with whistles but ineffective. Outside of downtown and the waterfront where the Downtown and Waterfront Partnerships patrol keep streets and walks clean, trash piles up on sidewalks and along the curb supplemented by the banned plastic bags put out on any day even if it isn't collection day. Hawkers offer legal or illegal items in plain view, loudspeakers blare the sermons of self appointed preachers, carcasses of spindly trees planted with an aspiration for a greener city live out their last days, squeegee boys or beggars harass motorists on all major arteries day and night. All this may seem petty in light of capital crime and police corruption roiling Baltimore. Yet, this particular combination of emptiness and unruliness is a curious state of affairs in a time when cities compete over being walkable, exciting and attractive places in which to move around on foot, by bike or transit. When the vitality of the public space has been recognized as a symbol for the viability of a city and its functionality as a community and as a litmus test of democratic expression it matters that a large number of the 2 million residents of the greater Baltimore Metro area don't seem to consider the streets and plazas of their largest city as a place where they want to go. The pulse of public spaces is like a canary in the mine-shaft: Deserted public spaces, whether abandoned for fear or by exclusion, are indicative of a larger problem, they signal a rift in the social compact which makes a city work. Empty public spaces aren't a good thing, whether ones look at it from the prevailing single-lenses of economic development or healthy retail, from the idealized architect-planner perspective of the "public roam" and the urban commons, from the perspective of those policing it, or from the standpoint of the community itself seeking to increase their quality of life. History informs about how public spaces were produced, perceived and experienced. In the post-war suburbanization of America, privatization of public space contributed to emptying out the central cities not only by robbing them of residents who could afford to move but also by taking away importance and meaning of mingling in public. The park loses meaning when green space is atomized by single family homes with private front and backyards. The urban plaza loses its attraction as a space of gaining information (knowledge) when each living room has a TV. The outdoor space loses importance of escaping the heat when everyone has air conditioning. Walter Benjamin and Jane Jacobs pointed to the essential human function of mingling, observing and producing. Planners, designers and developers have long reverted those car-centric destructive sprawl trends in favor of principles straight form Jacob's book. What's up, then, with Baltimore? In part 2 of this article (published next) we will look at exclusions and rights in the public space, see why Baltimore feels so often empty and what Jane Jacobs and the French philosopher Henry Lefebvre (the "Production of Space") may have to offer not only for a deeper understanding of the problem but also for developing multidimensional solutions. Robert Moses is now considered to have been an authoritarian planner who plowed his grand visions ruthlessly through the fabric of communities displacing especially black and poor people in favor of roads and new housing high-rises. But Moses also created beautiful New York parks and parkways in his role as metropolitan Park Commissioner, appointed in 1934. 82 years later, our governor still shares with Robert Moses the love for the automobile; however without Moses' appreciation for design and beauty which characterized his many New York parkways. 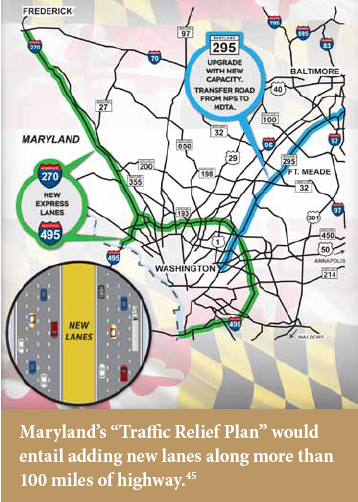 For Hogan the now 54 year old B-W Parkway is merely another conduit for cars which needs widening. He is is not bothered by the long history with early concepts going as far back as L'Enfant, route planning from Charles Eliot (1910), and real planning started by the National Park and Planning Commission which was created in 1926. 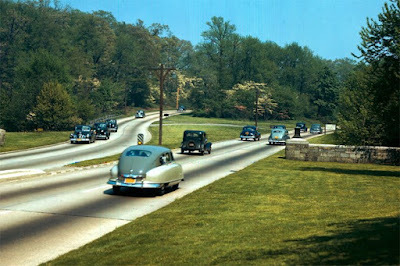 The B-W Parkway is the only fully developed parkway in Maryland. 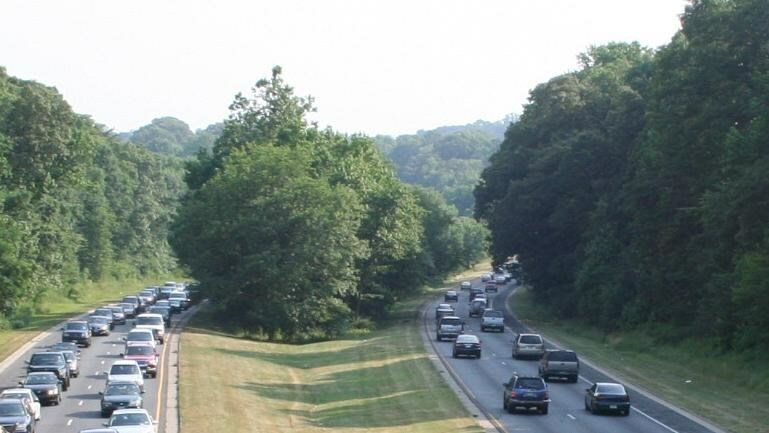 The Governor wants to buy the 19 miles of Parkway currently managed by the National Park Service from the feds so he and his road addicted Secretary Rahn can turn it into another eight lane commuter night-mare like I-95 as part of his $9 billion "traffic relief plan". The State sure has extra money, after the Baltimore Red Line was tabled and the increased gas tax keeps flowing. (The State actually envisions much of the road cost to be covered by private consortia who get to collect tolls). On the other side, the National Park Service under Secretary Zinke and President Trump is eager to offload a costly "burden". A deal made in hell. Given Hogan's past insensibility to the subtleties of transportation, it is not likely he or his secretary would pay attention to the fact that the B-W Parkway was carefully placed along the geological fall line between the Atlantic coastal plain and the Appalachian Piedmont. (NPS website) and as part of a regional park system explocitly designed as a contrast to the ugly commercial corridor of Route 1. Nor would he care that the Parkway has maintained green buffers on both sides which make travel on it a pleasant experience in spite of all the sprawl that has filled much of the land between the two metro areas. The extra lanes would kill tens of thousands of trees and expose much of the ugly stuff that has sprung up near the route. The Governor doesn't care that the Parkway runs along the Agricultural Research Center, the Patuxent National Wildlife Research Refuge, Greenbelt Park and Fort Meade, all precious large green open spaces. 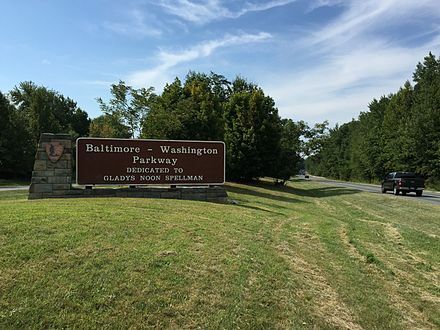 He doesn't care that it touches a number of places with historic significance, all reasons which landed the Parkway on the National Register of Historic Places. The realized Parkway suffered from the beginning from the fact that the critical gateway into the Nation's Capital, a key original motive for the early concepts, was never integrated into the actual parkway, even though the National Arboretum sits right next to the freeway entering DC. Even less considered was the manner in which the parkway would arrive in Baltimore. By the time it was actually constructed in 1954, traffic relief and economic development had long trumped the loftier aspirations of the 1920s and 30s. Today Baltimore's southern gateway is dominated by the incinerator's smoke stack, Baltimore's largest polluter. Still, when in the pre-construction debates of the 1940 funding through a Maryland toll road was considered and legislated in Annapolis in 1940, this approach was nixed by Congress. By 1950, though, Maryland had already completed 7 miles of the project leading to its Friendship airport, the portion that remained in the responsibility of the State ever since. Today, the real opportunity the Parkway offers, is to redesign these two termini so they are worthy of the parkway's initial aspirations. Instead, the Governor's plan is to make the 19 mile centerpiece just as ugly as the two ends. This is a crime against history, historic preservation and the future of sustainable transportation all at the same time. It should not stand. A breakthrough on Roland Avenue? Bicycling, even more than transit, is a mode of transportation for which users are far fewer than those with strong opinions. Thus improvements for bicycles are caught in a vicious cycle, namely that people with a different interest dominate the discussion wondering aloud what all the fuss is about. As soon as a bicycle facility threatens to take up some of the precious road space, those critics like to observe how few bicyclists are out there and that Baltimore isn't Amsterdam or Copenhagen. Which is kind of like saying Baltimore is not Munich and asking everybody to drink Coors Light even though it surely has been demonstrated how micro-brews, coffee-shops and bakeries can shake up common assumptions on how an American city has to be. And sometimes the solution of the future is something that Baltimore had plentiful in its past, such as breweries, bakeries and, yes: bicycles. Naturally, to observe those who swim across a river to determine the need for a bridge is defeatist: No facilities, no bicyclists. Bad facilities, are good as fig-leaves but they don't really promote bicycling either. At times they are worse than none because they provide fodder for epic conflicts that don't serve a more holistic approach to transportation either. presented an exciting opportunity to incorporate complete streets design tactics, the community feels there was not sufficient involvement in vetting the actual engineered design solution. 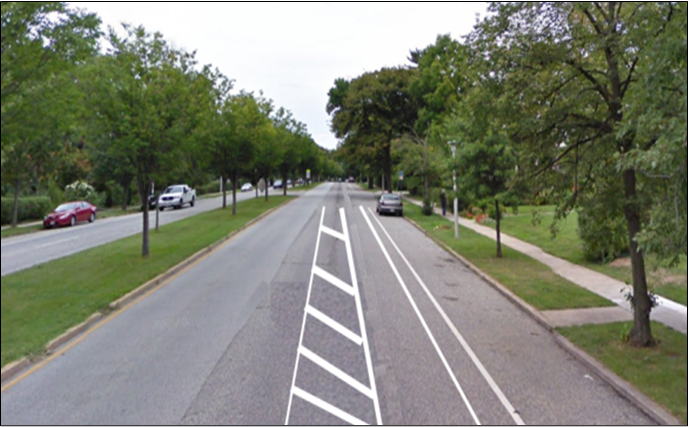 As a result of skimping on standards, drivers on the right lane of Roland Avenue felt squeezed between the cars on the left lane and those parked in a tight parking lane. 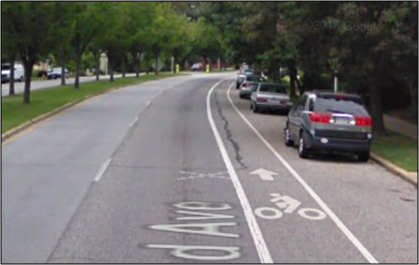 The too narrow parking lane put sloppy parkers either into the bike-lane to the right or into the travel lane to the left. There was no margin of error for opening doors on either side. Area residents reported damaged cars, clipped mirrors and bicyclists reported that vehicles were blocking the protected lane way too often. 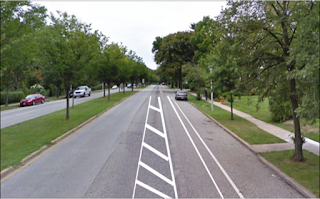 Many residents wanted the earlier curbside parking back with a striped bikelane alongside two travel lanes, the condition that was in place when a intoxicated and texting driver ran into a bicyclist in that lane and killed him. It was that crash which demonstrated in a tragic way that simple paint lines provide no protection to bicyclists, no matter that cities around the country had opted for this cheap and easy way of demonstrating bike friendliness. After the crash the bikelane was moved to the curb so that the parked cars would provide a barrier. While the rest of America discusses the inequity issues related to bicycling and bike sharing (Bikeshare still has a Race Problem) Baltimore focused on how to rebuild this bikelane in an affluent area for a second time. That seems like a colossal waste to some, but it shows that the idea of making streets work for more people than just drivers isn't as easy at it appears. After years of bickering, stereotyping, and a lot of foot dragging from the responsible department, Baltimore City DOT, to its credit, has now emerged with a set of carefully considered options which will be up for comment until June 28. To boot, the "preferred option" appears to be not only a wise solution, but Director Pourciau also took a clear stand for it (Option 1). It gives all modes a safer space and maintains the major standards for road design. It resembles one of the options Alta had developed in its memorandum. In total, DOT worked out five options, all but one take away the second travel lane. The only solution with two travel lanes remaining returns the status quo ante, i.e. a non-protected lane, clearly not equally valuable. 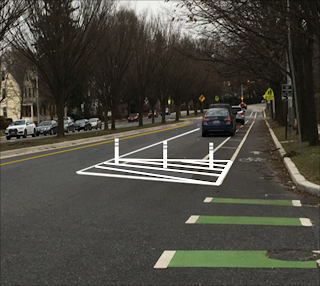 Removal of a protected bikelane shown in masterplanning and already constructed opens up potential liability for the City, Jed Weeks of Bikemore explains. Option 1 is supposed to cost less than $250,000. It includes some curbside loading near schools as well. The department studied speeds, traffic volumes and delays. The analysis shows that two travel lanes are not needed for handling the traffic volumes on Roland Avenue. However, they are useful for throughput at signals, the capacity choke points in any road. A one lane road creates some longer queues and delays at signals. According to DOT this increases the trip time in the 2.5 mile segment from 5 minutes to an estimated 6-7 minutes and drops the "level of service" on some intersections by one grade. The intersection with Cold Spring Lane already operates at level F in the "pm peak" and will remain so since there is no lower grade available. Some local residents still like to get the familiar curbside parking back, as the June 14 public meeting showed. 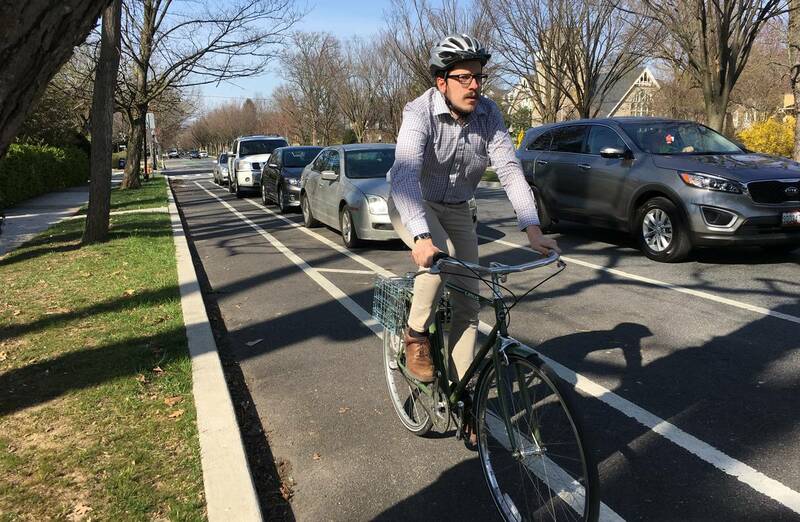 However, there is also a petition of residents with children who ride bicycle underway, petitioning DOT to stick with the new preferred option. 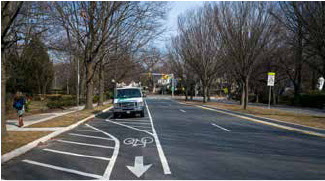 Together with the recent resolution for a pair of protected east-west bike-lanes on Centre and Monument Streets, and the temporary pop-up installations of the "Big Jump", which connect Remington and Reservoir Hill, one can get the impression that after the protracted battles on Potomac Street and Roland Avenue BC-DOT has regained its footing when it comes to bicycles. 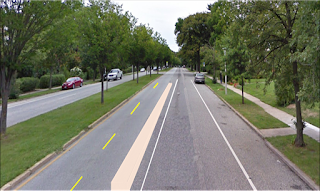 To remove the still present threat of the Baltimore Fire Department of nixing any single lane traffic solution under 20' width, Councilman Dorsey introduced this week a Baltimore City fire code amendment which removes the excessive fire-lane requirements for public streets. Baltimore has a long way to go to become a city that really respects walking, transit, bicycles and cars, but recent steps are going in the right direction. With about 30% of the city's overall footprint, the design of public streets really matters. Just like accessibility laws made facilities more usable for a whole lot of people, complete streets will make a better city for all. 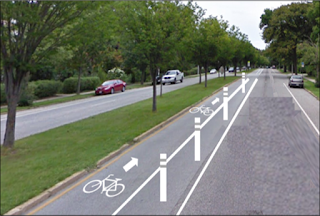 Wall Street Journal: Creating Bike Lanes Isn’t Easy. Just Ask Baltimore. Transit can be a geeky affair in which esoteric metrics are batted around way over the heads of a largely indifferent public which consists of a minority of people who actually use transit and a vast majority of car drivers who care about transit usually as much as fish care about bicycles. Yet, they quickly chime in when people call transit performance poor. Transit bashing is almost like an obligation in Baltimore, especially now during the campaign. On occasion of the anniversary of renaming all Baltimore transit "LINK" MTA offers a video celebrating "Take Transit Week" under the slogan "dump the pump". In the video a voice says "find out why everyone is excited about "LINK". So, what is really going on? Is Baltimore transit as terrible as the political candidates and some transit advocates make it or are people "exited about the new LINK"? 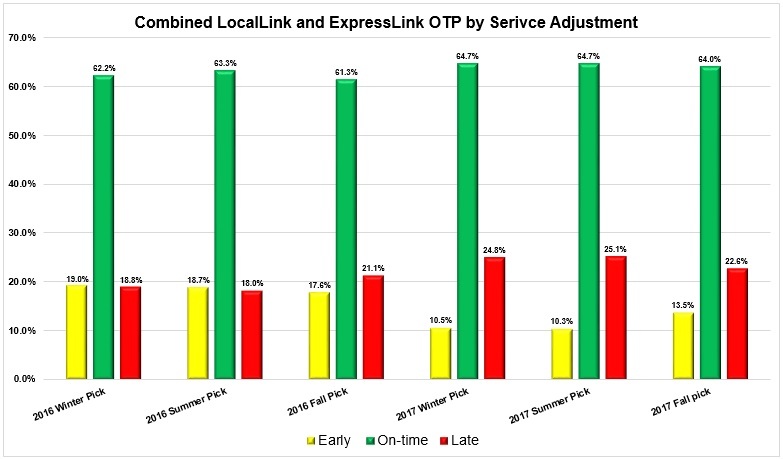 In spite of all the talk about data, it is still hard to figure out how well LINK performs except for transit ridership and on-time performance, two metrics which the agency reports on its own website "performance improvement". The graphs posted there end in February 2018 and they don't look too good. The SUN posted a different graph provided by MTA. It shows May 2017 almost on par with May 2017 thanks to an uptick in the spring, possibly due to rising fuel prices. It comes handy that the Office of Budget Management (OBM) prepared a MTA review and analysis for Maryland lawmakers earlier this year in the context of bills which affected MTA. This little known document gives a fairly comprehensive view of the current performance of MTA's existing transportation systems. It gives also a partial answer to the question whether LINK Bus was a success. The document indicates that Core Bus Ridership has declined precipitously in 2017 from an annual ridership of 75.619 million riders in 2016 to 69.587 million, a decrease of more than 6 million riders, or 7.9%. 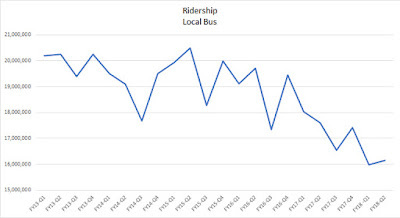 (By comparison, the bus ridership loss at WMATA was 4.5%). While the MTA bus rider loss continues a decline that has been going on since 2013, it roughly doubles the previous percentage loss. 2017 was the worst performing year in eight years. Maybe this isn't a surprise, given the extent of this reform which resulted in lots of initial confusion. The real test will be the 2018 numbers. The OBM is not optimistic and projects another 5.4% loss for 2018. 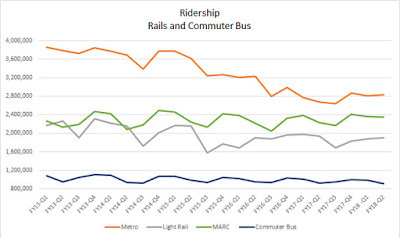 Light rail ridership remained almost exactly the same between 2016 and 17, mobility service had a slight increase. Less riders means, of course, higher cost, especially if service remains constant and operator salaries, energy prices and such would go up. The 2017 cost per passenger trip is with $3.67 the lowest for bus and the highest for the mobility service with a whopping $40.94. The cost for Metro and Light Rail is $4.56 and $6.20 respectively, for MARC it is $16.63, in part because the rail services have longer trips. The commuter rail fare is also higher than the bus/LRT/Metro fare. 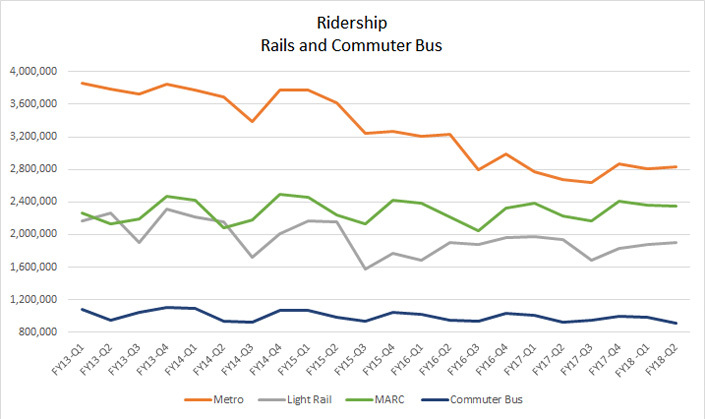 Thus the farebox recovery rate for MARC is actually the best with 45% and the lowest for Light Rail with 17% with the bus in the middle at 27%. (The mandate to recover 35% has been eliminated by the legislature in 2016). By comparison, WMATA's farebox recovery for buses is 21% and for Metrorail a whopping 57% (Anybody who has paid fares for the DC subway knows, riding it ain't cheap). Not included in the OBM report are the data that were used in the modeling of the alternative bus system. Those model numbers which include average commute times, % of people with 1/4 mile walk access to transit, and % of jobs within walk access of transit were given for early LINK system concepts but were not provided by MTA for later iterations or for the actual system in operation. It is relatively easy to find quantitative data which compare the MTA to transit in other metro areas, for example in the MTA open source data or the annual APTA report which puts the 50 largest transit systems into easy to understand side by side comparisons for a number of fairly obvious metrics. In those, MTA always looks pretty good because there is comparatively a lot of transit on the ground in this metro area. (see recent blog article). Even with reduced ridership, the MTA moves some 300,000 people a day on their various modes, not something one can dismiss as irrelevant. Not only is it impressive to move that number of people if one considers the logistics that are necessary to do this day in and day out, mostly on public roads with all the vagaries they offer, not least it is congestion which gums up the cogs of the MTA transit machinery. 300,000 riders is also a lot of people who are seriously affected when transit doesn't work as expected, especially in a region where so many have no other choice of getting around. Among the nation's large cities Seattle stands out with vastly improved bus service and ridership increases that exceed population growth. Otherwise the picture for transit usage and especially bus ridership is bleak, not just in Baltimore. And there is hardly a company that doesn't draw the scorn of its riders and derision of a public that mostly doesn't care. What is to be done? Governor Hogan's response of paving ever more lanes on chronically congested highways is no better than giving an alcoholic schnaps for a cure. Even if all vehicles would be electric tomorrow and self-driving the day after, cars cannot be the solution for urban and metropolitan transportation woes. There simply isn't the room for them, nor do wider roads make good cities, no matter what car technology is used. Although it seems so un-American, the long haul of more, better and more frequent transit by bus, rail in tunnels or on the surface will have to be undertaken. If anybody thinks, that Elon Musk can provide the magic solution with cars in tunnels, wake up! He won't. As hard as it is for a country that considers itself as more advanced than any other, it is worth looking at France, Spain or China. All those countries have embarked on high speed long distance rails, high density development near rail infrastructure and a radical departure from reliance on the automobile long ago. So long ago, in fact, that they already have much of the networks which we still ponder for a distant future. Much could be done to utilize our existing trains, subways, commuter trains and buses better, mostly not by magic tricks in operations but by creating a land use pattern around the systems we have, instead of against them. When we go to the ballot box, we should consider this. As long as we don't want to pay the taxes which are needed for a decent infrastructure, as long as too many people still want to live in remote areas and drive 2-ton vehicles to work, we can beat on the MTA as much as we want, we will continue to see not only a decline in transit ridership but also a decline in our economic resilience. Video about GPS on buses and the Transit App. The State Center complex is an interesting case study in urban planning. 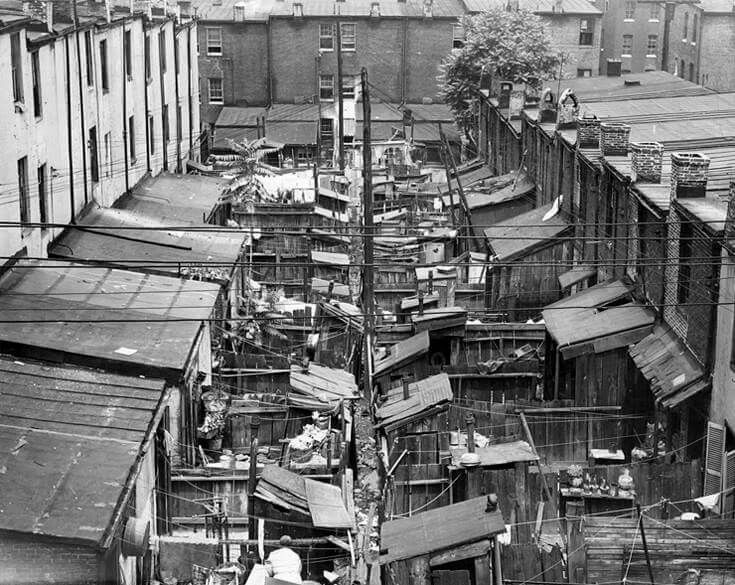 Conceived as far back as 1954, State Center falls into a period in which Baltimore had resolved to do "slum clearing" under the "Baltimore Plan" mostly through rehabilitation. This was later followed by "urban renewal" in which entire sections of the city were wiped out in a series of attempts to make traffic move better, remove "slum and blight" and make the city more modern. Today those large-scale urban renewal plans are generally seen as colossal failures, in part because of the motives behind them, in part because of the outcomes, and in the case of the State Center area, because the clearance was disruptive and to this day the site remains way underutilized in a strategic location: Disconnecting neighborhoods instead of connecting them. While it was a great idea to concentrate State office functions in Baltimore, the State's largest City, and provide State workers with modern light filled office built to the latest standards of that time, the thinking of the time created so many of the problems Baltimore has today. 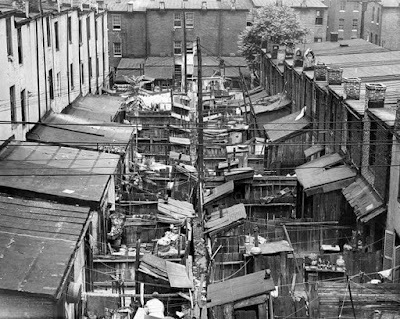 For one thing, massive amounts of housing had to be removed for the new vision, destroying history, human and physical connections and displacing many people from then stable communities. 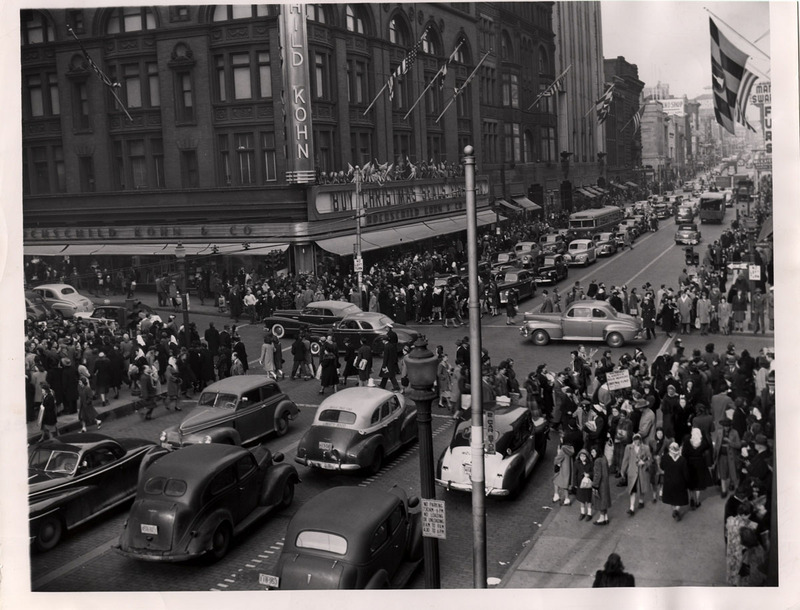 State Center reflects the economic reality of 1954, namely that the City needed to have more and better office space than the historic downtown could offer, an insight that also fueled the Charles Center urban renewal. It also reflects the suburban mindset of the area with its focus on the automobile and how suburbanites can quickly get in and out of the city. State Center as an urban renewal concept is hinged to the idea of the urban freeways that was hatched in those days as well, only partly realized in Baltimore, but the Jones Falls Expressway, the East West Expressway, in which Robert Moses had a hand as well and which later became the disastrous "Highway to Nowhere", the downtown bypass (Martin Luther King Boulevard) as well as the abundance of parking were all signature ingredients of the essentially suburban office campus. But it became clear as early as the 1970's and even before the first oil crisis that the automobile could be a bane for cities if not accompanied by great transit. President Johnson's Great Society plans gave Washington its Metro, San Francisco its BART system and eventually also Baltimore and Atlanta their respective skeletal Metro systems. State Center got its own subway Station which opened in 1983. Then as today a period of reform ended in a phase of reactionary policies with Richard Nixon in Washington and Spiro Agnew first in Annapolis and later with Nixon. This strategic location matters. Today other assets count: The area is considered to be Baltimore's cultural center thanks to the Meyerhoff symphony hall, the Lyric and the proximity of the Maryland College of Art. Bolton Hill is a stable community showing the beauty of Baltimore's historic architecture in the best light. Mount Vernon is thriving and Murphy Homes public housing towers have been redeveloped into a smaller scale mixed income community called Heritage Crossing. Only State Center remains as if time had stood still. The suburban office park is even dead in the suburbs, it is intolerable in the heart of city neighborhoods. This has been recognized for quite some time. Comprehensive studies have been conducted since 2004 under a variety of governors and mayors. Citizens were involved, consultants hired, paid and released until a consensus plan emerged. A plan with private and public uses, new office for State office workers and plenty of new residential and commercial spaces to fund the endeavor. Connectivity would be restored, the subway station would get better use and the adjoining neighborhoods would have a vibrant neighbor with a rich mix of uses instead of the dull single use assembly of today. 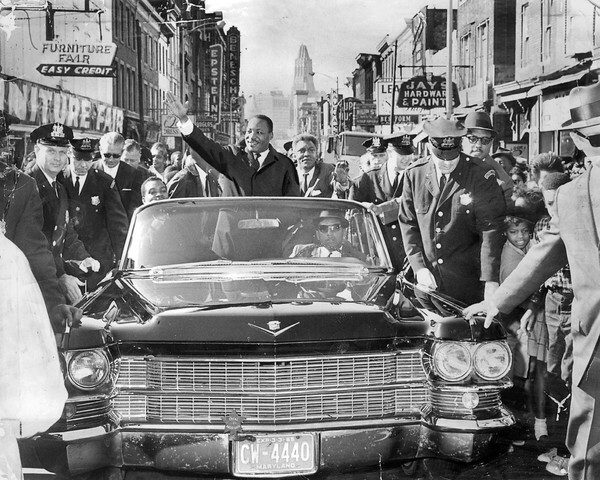 But just as Spiro Agnew as Governor in 1968 never understood the Baltimore uprising that followed the assassination of Martin Luther King, suburban Governor Larry Hogan doesn't understand the real reasons for Baltimore's unrest of 2015 nor does he really care for what a big city tick these days. He hasn't even taken the lessons of the oil shock of 1972 to heart and still promotes the transportation policies of the 1950 with the automobile uber alles. Just like Agnew easily dismissed the new black majority in Baltimore and actively catered to the fears and aspirations of suburban and rural Maryland, Hogan's electorate doesn't sit in Baltimore City and he can easily yank the two largest investments the City had aspired to under Governor O'Malley: The Red Line and State Center. 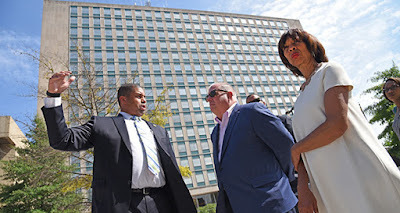 The bus reform for 4.6% of the Red Line budget and the much touted project CORE for demolition of empty rowhouses can't disguise the fact, that Baltimore just isn't this governor's priority. Except the pronouncement was wrong in both halfs of the sentence. Neither was there "inaction" during the last fifteen years, nor was there any way to move forward. He, the Governor himself had created the roadblocks that ultimately lead to inaction of years of planning and consensus building. Inaction is what best describes his years in office, not the 11 preceding years. As a real estate professional himself Hogan knows very well that years of planning and creating entitlements (A Planned Unit Development plan has been adopted by Baltimore City) is not nothing. In today's world of very slow planning the past 14 years or so are very valuable and can't be simply tossed away, neither by him nor by those who made the investments that enabled the process. Naturally, the lawyer representing the development team that had been working on the project since 2009, immediately denied that there has been any kind of breakthrough. Given that the team doesn't just consist of Struever Brothers successor Ekistics but of nationally well know entities such as McCormick Baron Salazar and reputable local minority firms should give a governor pause who proclaims that Maryland is "open for business". His "just to get rid of these guys" phrasing is insulting to companies that want to invest in Baltimore and sounds much more like the US President than Hogan should like who usually likes to keep his distance from that man. But his assertion that the State Center deal is terrible and "illegal" sounds just like Trump talking about the Iran deal that the rest of the world would like to save. Hogan who likes to show up in Baltimore to confess his love for the City proves incapable of comprehending that the State Center deal he has tossed out by suing the development team in 2016 is not about some specific people he apparently doesn't like (but never sat down with to negotiate) but about the blood. sweat and tears that this site represents: First as an example of bad urban renewal carried out on the backs of the displaced residents and businesses and then as a place of hope bringing about an all-out effort by hundreds of people to forge a consensus plan for the future. Stunts like his media spectacle on Thursday of last week will do little to move forward. The key to getting out of the stalemate is entirely in the Governor's hands. Instead of his overblown rhetoric about how bad a deal the State Center project is, he should employ his skill of looking somehow bipartisan, eat his pride and engage in a real serious negotiation with the development team. If Hogan doesn't like the deal, he should sit down and improve it in a fair negotiation that doesn't begin with insults. Exactly, what one would expect from a Governor who wants to be elected for another four years. The last thing anyone affected by the bad current conditions, neighborhood leaders or State office workers, want to do, is to start from scratch. Especially not studies and investigations that are as useless as what the Governor had ordered last year and received early this year "as a new State Center Plan", a quickly thrown set of unbaked ideas which nobody took serious as useful blueprint. Baltimore SUN about O'Malley punting on the project in the last minute. When it rains it pours, the saying goes, and residents of historic Woodberry, a small "village" in the valley of the Jones Falls think that is certainly true for the development raining into their community. They even mean it literally when they darkly refer to historic Ellicott City, a place that, some say, has been drowning not only from too much rain but too much run-off caused from too much development. It isn't particularly new that existing residents don't like additional development. While rain and stormwater run-off may be a fairly novel argument in the arsenal, traffic flow has long been a staple to fend off new development. Then there is the concern of gentrification, school overcrowding, the state of infrastructure, the loss of historic structures, authenticity and history, and the eternal question where everybody will park. 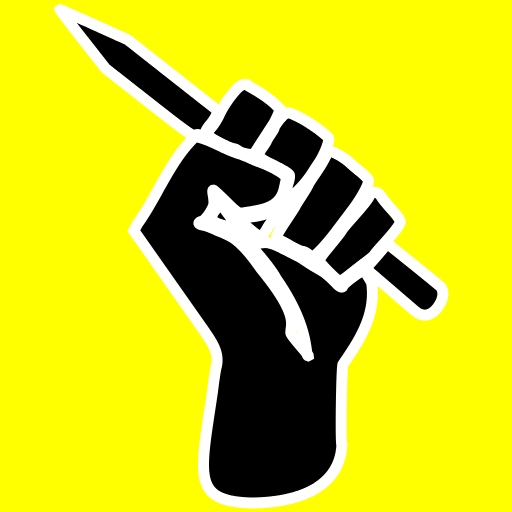 Increasingly, developers go to battle armed with studies and a vocabulary designed to squash the litany of complaints from progressively minded citizens on their own terms. This was on full display today when Chris Mfume, youngest son of the iconic Baltimorean Kweisi Mfume, had his architects present his apartment project in Woodberry to UDAAP, Baltimore's recently revamped design review panel. Residents will get to see the presentation on Monday June 19 as well. 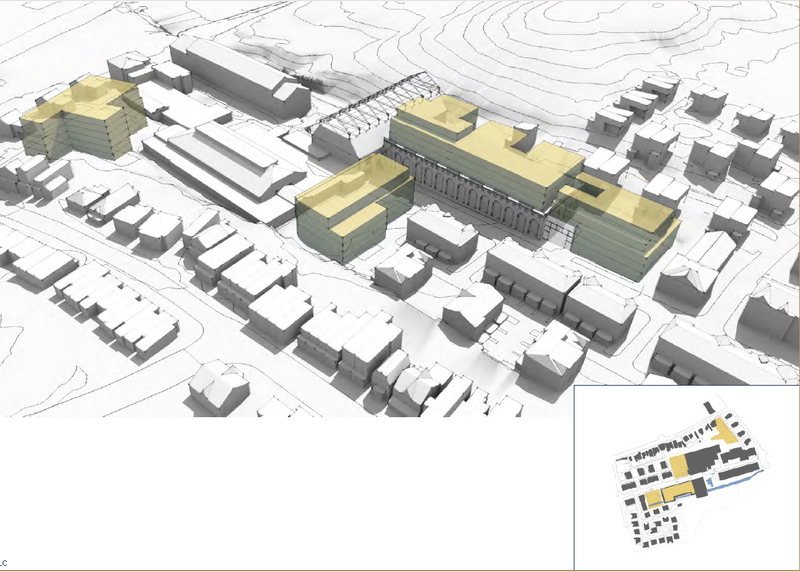 Battle experience was also on display when Caroline Paff and her team presented early masterplan concepts to the Woodberry community last Tuesday, a presentation that landed on the front page of the SUN paper above the fold. Paff had been baptized by fire when she worked for Sagamore Development and its many highly contentious public presentations. 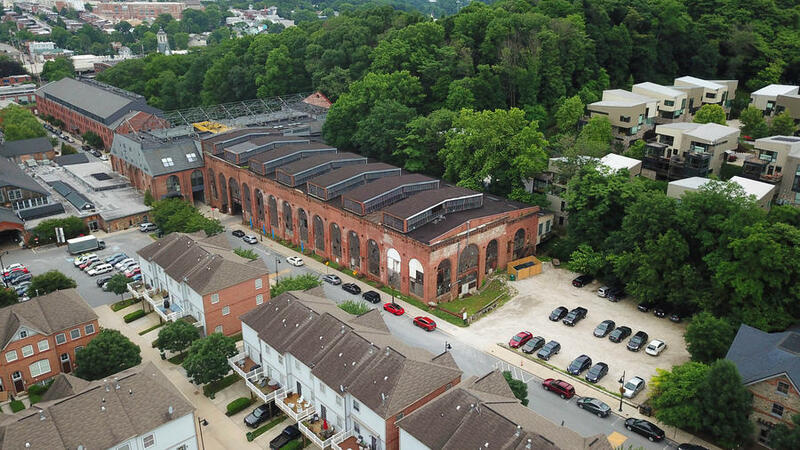 The focus on Woodberry brought Baltimore's attention back to a segment that has become known as the "White L", the parts of Baltimore where most development happens and where communities are predominantly white. Recently, several proposals for community reinvestment and social impact funds had directed attention to the "black butterfly" sections of townfor a while, to places where development is way too infrequent, but where it is seen with even more suspicion with concerns around displacement and gentrification trumping everything else. The presentation for a new 80 unit studio apartment building wedged between light rail tracks and narrow Clipper Road had generated a disproportionately big swirl of media postings thanks to two very old stone buildings standing on the swath of land which Mfume had acquired. Those buildings are part of a quite intact assembly of some 32 historic worker housing units associated with the historic industries and mills clustering in the river valley. Those old mills and their related architecture had long been neglected and lain fallow in the shadow of the elevated JFX, barely noticeable from the cars zipping by on the expressway, but in plain view from the light rail line which shuttled suburban riders through here since 1992. The mills seemed to be doomed for good when London Fog move out of town and the head building of the Clipper Mill industrial park was consumed by a gigantic fire which killed a young Baltimore fireman when the front wall collapsed on him in September of 1995. Much has changed since then. Nearby Hampden has turned from a quirky, and often considered racist, white, working class community, into a sought-after, diverse neighborhood with a bustling "main street". Union Mill on Union Avenue has become teacher housing and its power plant has become a rustic coffee shop. London Fog is now Meadow Mill with a fancy restaurant, an athletic club, performance spaces, consultant offices and a bakery, the result of an investment by Developer Sam Himmelrich. He and his former partner Tufaro have been especially creative in re-purposing the old Jones Falls Valley Mills with Himmelrich converting one such complex to Baltimore's first Whole Foods further upstream, and Tufaro more recently completing Mills # and #2 along Falls Road as housing and mixed use conversions. Local brews are crafted and consumed in the area, Union Brewery is slated for a grand opening of their new facility in the near future. Sleepy Woodberry had already become a destination when Bill Struever brought back the burnt Clipper Mill complex with a condo building roughly in the shape of the destruoyed main mill building and a range of very cool adaptations of historic industrial buildings into such destinations as Guiterrez metal studios, Woodberry Kitchen, and apartments inserted into an industrial hall without a roof in which a huge overhead crane still hovers over top. (The Assembly Building). A sunken pool on its side exudes the cool ruin-chique that since has become even more fashionable. This is a long introduction to what was presented by the two partners of PI.KL Studio, Pavlina Ilieva and Kuopao Lian on Wednesday morning. But it explains why start-up developer and investor Chris Mfume had his eyes set on the non-descript parcels. It also describes the trajectory that many of the historic structures took before: Forlorn and forgotten until an investor came along. The circuitous history also explains why Mfume, young and maybe not as versed in the mill history as Himmelrich and Tufaro, apparently underestimated how explosive it could become to simply raze the 160 year old mill houses, even if early on the community was reportedly unconcerned. The context also explains why the the words "transit oriented development" (or TOD), bicyle storage, walk access to the light rail station, compatibility and "urban code" as well as community permeated the presentation to UDAAP. There was also an empahsis on details such as noting that the old houses had their back turned to the street, that the residences across the street where actually 7-8' elevated above the street level and how far the new building was sunk into the ground. "We are now studying up [on the history]" Mfume told me after the UDAAP meeting today. Its hard to blame the man, because unlike the neatly kept houses north of Clipper Road, the buildings south of it have long been non-residential in their use and where both nearly swallowed up by additions. The outcry and the rude accusations that came with it also bruised architect Pavlina Illieva. But the push-back already caused a shift in the team's approach. From simply re-using the recovered stone blocks in the facade, the team pivoted to integrating the two houses, at least in part, into the 60' tall contemporary apartment building. The result is a stark contrast between modern and 160 years old, between low houses on the north and a tall slender building on the south of narrow Clipper Road, a design approach that Americans still need to get used to, but which is common in Europe, where old stuff is frequently juxtaposed with ultramodern interventions even in historic districts. The new UDAAP review team was initially a bit shell-shocked by having to evaluate the design of their own (recused) chair. The reviewers were generally positive and it sounded as if out of conviction and not out of reverence. Payam Ostovar, a landscape architect from DC said he was "excited" and that how the old structures were pulled into the building was "really fantastic". He, part of the demographic of young urbanites for which these apartments are obviously designed, suggested that there should be a rooftop amenity for the new residents to orient themselves. Osborne Anthony, an architect at AECOM in Baltimore, was more careful in his judgement, calling the stone houses important "sentinels" of the past, worth protecting and keeping around. He made several suggestions about the facade detailing and window rhythm and placement which the two design architects welcomed with head nodding. Planning Director Stosur noted how the preserved facades looked stunted compared to the residences across the street and suggested the use of porch elements to make a reference to the residences. More nodding. Meanwhile, ValStone development got caught in the refreshed community sensibilities when they presented their ideas for the much larger development of the remaining parcels inside the Clipper Mill planned unit development (PUD) on Tuesday. Those parcels were left behind when Bill Struever ran out of steam in the wake of the financial crisis. Caroline Paff says that the new buildings have no designs yet. For the old Clipper Mill PUD, community concerns center less on historic preservation and on the old stand-bys of traffic and parking instead. Anyone who has tried to find a parking space to eat at Woodberry kitchen or attend an event knows that parking is already difficult, and easily could become more so, especially if the old "Tractor Building" (which currently serves as a makeshift parking garage) would be redeveloped. 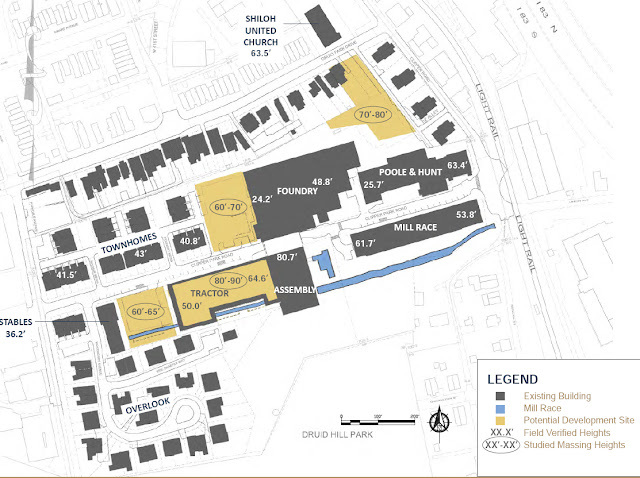 The fully executed additional development could add up to 350 units in various phases. The Tractor Building would be part of the initial phase. Conservatively calculated the new units could add as many as 140 trips during the afternoon "peak time", however it is expected that there would be a 25% transit "TOD decrease" by virtue of the nearby light rail line. Depending on the build-out, calculated parking demand would exceed the supply by 20 or 12 spaces. Not included in the analysis is that parking needs will most likely be drastically reduced by an increase in fleet based ride sharing in urban areas. Unlike the past carefully grafted insertion of apartments into the Assembly Building building to the east of the Tractor Building, the developer apparently plans to add several levels on top of the Tractor Building, significantly altering the appearance of the industrial hall with its shed skylights. A preservation discussion may be in the offing for this proposal. 42 slides address concerns about how much development, how much traffic, and how much stormwater were assembled by the consultant team of Colbert, Matz and Rosenfelt (civil engineering), Green Street Environmental, Marren Architects and Lenhart Traffic. There will be limited space for surface water treatment and about 50% of "new" stormwater will probably have to be managed with an underground facility which will replace an existing storage facility which was placed before the new, stricter regulations which require management of 2, 10 and 100 year storms. Flooding is certainly an issue in the Jones Falls Valley, but that the proposed developments would help to wash the old mills away any time soon is not likely. They will, however will give more people a chance to enjoy urban living, transit and enjoy the wonderful Jones Falls trail and the beautiful Druid Park. If the historic character of Woodberry can be properly preserved in the process, one could call it a success story.